If you're looking for fun things to do in Orange Beach this summer, take your family or group on a private cruise to Robinson Island for a picnic or to simply relax and meet new, friendly people. 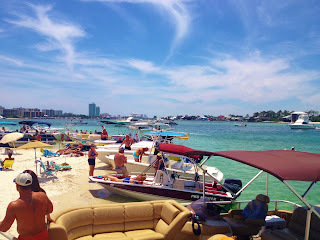 Robinson Island (pictured here) is a beautiful, white sand island in Perdido Pass, surrounded by beautiful water and teeming with boats full of friendly locals. The island is even a bird sanctuary, where exotic coastal birds nest and raise their young. Groups of up to 12 can be accommodated and there is a convenient restroom on board. You can also play all your favorite music from your phone. Private cruises book up fast, so don't delay in contacting Gulf Shores Boat Rental to reserve yours! We also offer: Sunset cruises in Gulf Shores; Stand up Paddle Board rentals in Gulf Shores; cocktail cruises in Orange Beach; picnic cruises in Gulf Shores; dinner cruises in Orange Beach; wakeboarding and tubing trips in Gulf Shores; and pontoon boat rentals in Orange Beach.